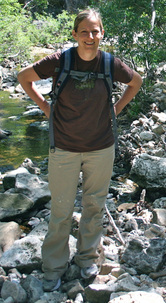 Dr. Allison Miller is an Associate Professor in the Department of Biology at Saint Louis University as well as a Research Associate at the Missouri Botanical Garden. She received her Masters Degree in Botany from Colorado State University and her PhD in Evolution, Ecology, and Population Biology from Washington University in St. Louis. She then accepted a position as a Postdoctoral Research Associate at the University of Colorado Museum. Allison is with us today to tell us about her journey through life and science. Genetic variation provides the foundation for species to respond to changes in the natural environment. It is well understood that intraspecific variation is distributed non-randomly within and among plant populations, and that contemporary patterns of genetic variation among populations within species result from ongoing evolutionary processes as well as historical factors. Understanding the factors shaping the geographic structure of genetic variation has become a central focus of evolutionary biology. It is particularly relevant for the wild relatives of domesticated species, which constitute an important component of the crop gene pool . Work in the Miller Lab occurs at the interface of testing evolutionary theory and generating data to contribute to the conservation of genetic resources in economically important species. We use a variety of approaches, including population genetics, phylogeography, phlylogenetics, ethnobotany, GIS techniques, herbarium study, and field-collected data.